Outdoor Is In, a pop-up fashion exhibition of 19 dresses created from re-imagined and recycled vinyl billboards and organized by Adams Outdoor Advertising, will be on view to the public FREE at Mint Museum Uptown from Wednesday October 19 through Sunday, October 30. The show, which features a dress from a recycled Mint Museum billboard along with billboard dresses from 15 other local and national businesses and nonprofits, will be open FREE to visitors during regular museum operating hours both weeks at Mint Museum Uptown at Levine Center for the Arts, 500 South Tryon Street. (11 a.m.-9 p.m. Wednesday, 11 a.m.-6 p.m. Thursday-Saturday, and 1-5 p.m. Sunday). Visitors may enter Level 5 without paying museum general admission if they wish to see only the fashion exhibition during their visits. “When we heard about the Mint’s celebration of the Year of the Woman, we recognized immediately that our first-of-its-kind project would be a perfect fit with the theme since the artists and designers who created the incredible dresses are all women,” said Jeannine Dodson of Adams Outdoor Advertising. 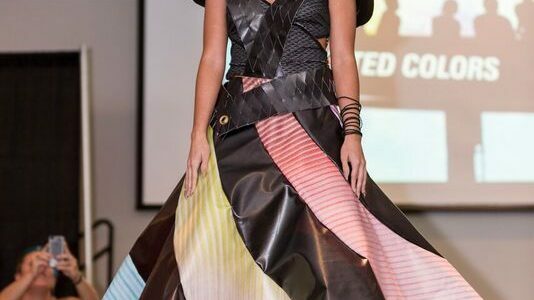 Other Outdoor Is In designers, who call themselves “TrashionArtistas,” are Elyse Frederick of Charlotte, Edelweiss De Guzman of Mooresville, Rocio Llusca of Charlotte, Teresa Rench of Fort Mill, Althea Womack of Augusta, and Marynel Watters of Cornelius. The designers used billboards from the following companies and nonprofits: Anheuser-Busch, Dunkin Donuts, Carolinas Healthcare System, Chick-Fil-A, Coca-Cola, Fink’s Jewelers, Hendrick Honda on South Boulevard, Husqvarna, Miller Coors, Killingsworth Environmental, McDonald’s, The Mint Museum, Nichols Store, Pepsi, Second Harvest Food Bank, and Wells Fargo. As part of the partnership, Adams Outdoor will be advertising Outdoor Is In along with the rest of the Mint’s Year of the Woman lineup on billboards around the Charlotte region. Outdoor Is In is the latest pop-up show in the Mint’s Level 5 expansion space, home to the previous groundbreaking shows 80 x 80, featuring 80 contemporary works of art organized by Young Affiliates of the Mint; Moment Mile, a photography exhibition from The Light Factory; and The Boombox Project, an exhibition of photos by Lyle Owerko organized by SOCO Gallery. The 15,000 square foot expansion space, still raw and unfinished, was first unveiled in 2014 as part of a partnership with Wells Fargo. The museum is still developing its longer-range plans for the expansion space and plans to continue experimenting with new and creative art concepts there. See more about Outdoor Is In at mintmuseum.org/art . Learn more about the Year of the Woman at mintmuseum.org/80th . Members of the media may view the show during the media preview for Women of Abstract Expressionism and Fired Up: Contemporary Glass by Women Artists from the Toledo Museum of Art on Friday, October 21 at 9:30 a.m. Light breakfast will be served and curators will be available for interviews. RSVP to leigh.dyer@mintmuseum.org. The fashion show and exhibition reflect Adams Outdoor Advertising’s commitment to recycling and protecting the environment. Designers used EcoFlex Vinyl, which has biodegradable properties, to make many of the Outdoor Is In ensembles. Another program demonstrating Adams Outdoor Advertising’s recycling efforts is Upcycle Life, a Charlotte-based nonprofit that trains and employs refugee women in our community. Adams Outdoor Advertising, with its flagship office in Charlotte, is celebrating this year its 30th anniversary in the Charlotte metro market. With offices in 14 cities in the U.S., Adams is a full-service billboard company that works to provide local, regional and international clients with the best overall media strategy for their products and services.